“This is risky and dangerous!” our daughter yelled with a laugh after she toppled over and became a tangled mess of skis and poles yet again while making her way around a track-set trail at Telemark Nordic Club. 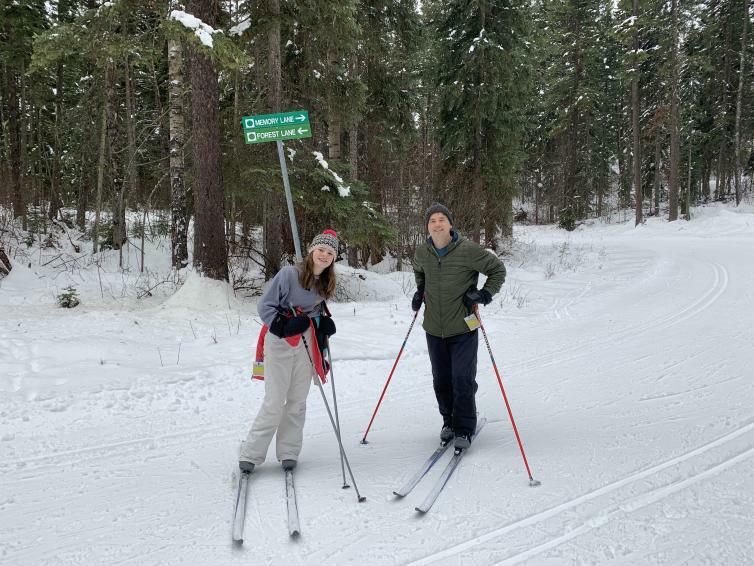 She usually downhill skis, so the switch to slippery, edge-less, skinny skis had, literally, thrown her for a loop on Forest Lane, the easiest beginner circuit of the club’s 16 groomed ski paths. She picked herself up, got back on track behind her little brother, and our family of four proceeded to “ski” (half-glide, half-slip) our way through the forest. It wasn’t pretty but it sure was fun—we bravely attempted our first hill descent and managed not to crash through a combination of wild balancing, erratic snowplowing, and letting our son grip our hands for the downhill ride. Why would an alpine ski family trade chairlifts and gravity for a flatland adventure out of our comfort zone? 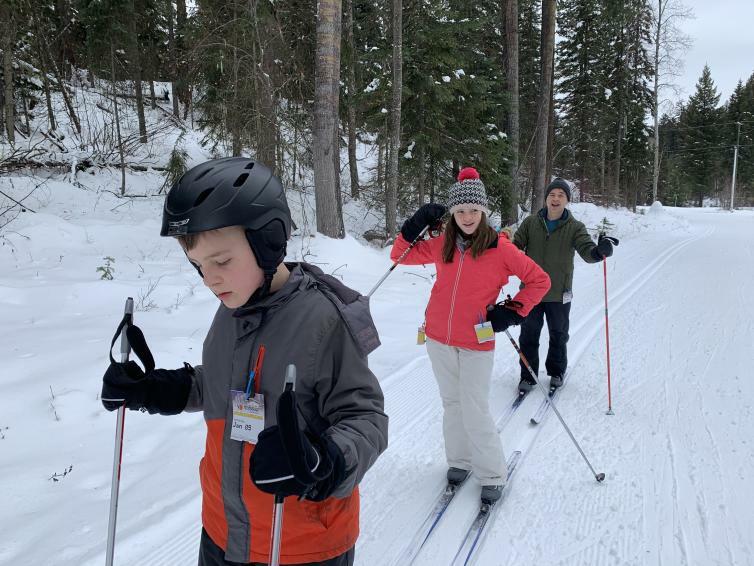 Our son went Nordic skiing on a school field trip last winter and liked it, and we wanted to expose our daughter to a new sport. Plus, it had been well over a decade since my husband and I had kicked and glided, so we thought, why not? 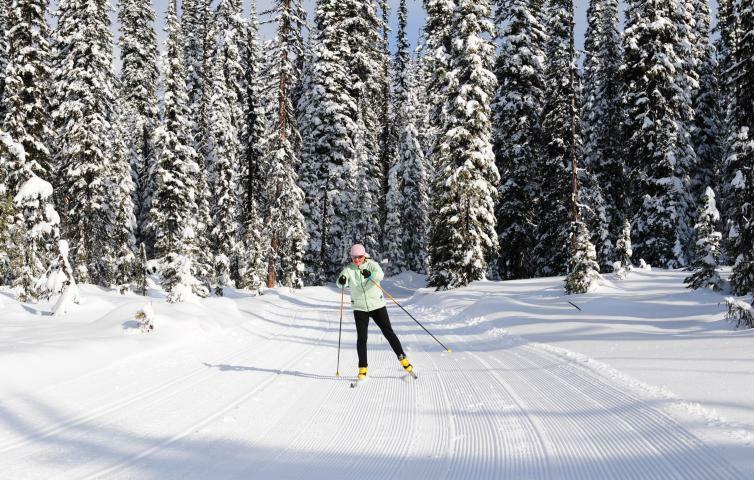 Telemark Nordic Club is located up Glenrosa Road in West Kelowna, an easy drive from town. If you don’t have equipment, there’s a rental shop on site that will get you set up. 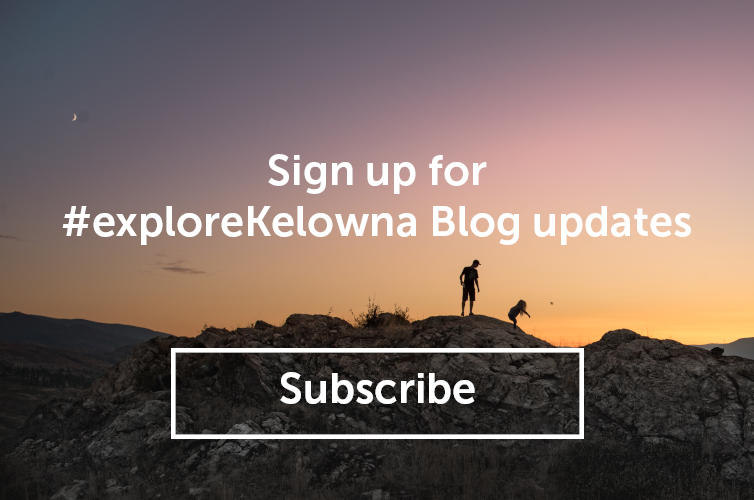 There are over 50 km of trails for all ability levels (one is dog-friendly), bathrooms, and a day lodge for eating lunch, warming up, and socializing with new friends. Newbies can even sign up for a lesson, which probably would have helped us with the ups and downs. After three laps we’d not only improved, we had worked up a sweat and shared more laughs (slow-motion crashes are hilarious!) than any other day during winter break. If you’re still not convinced Nordic schussing is right for your family, here are five more reasons to give skinny skis a chance. Everyone was so friendly and helpful that we couldn’t help but start off on the right ski boot. When another mom saw that my son was a similar age to hers, she introduced herself and struck up a conversation as we skied along. Fellow skiers said hello and offered encouragement, and when we returned our equipment at day’s end the woman at the rental shop wanted to know if we’d had fun. It was like we were part of the Nordic tribe from the get-go. Cross-country skiing is a great exercise because you’re moving all the time—no sitting on cold chairlifts or waiting in line, and the slower pace means less wind to cool you down. If anything, we dressed too warmly and had to shed a layer on lap No. 2. There’s also free hot chocolate powder and hot water in the day lodge so you can make yourself some cocoa if you do get cold. And remember to bring snacks so the children don’t complain about being hungry—constant movement leads to an appetite! We rented skis, poles, and boots for the four of us, and purchased four day passes to use the trails, for a total cost that’s less than one adult lift pass at a downhill resort. What’s more, we brought our own lunch and happily ate it at the day lodge, along with all the other families who were doing the same thing. There’s a small concession at the ticket office and even those prices were fantastic—Mr. Noodles for $2, for example. All in, we spent under $100 for a full day of fun and exercise. We saw adults, children, and dogs enjoying Telemark Nordic Club, and skiers with diversabilities, too. 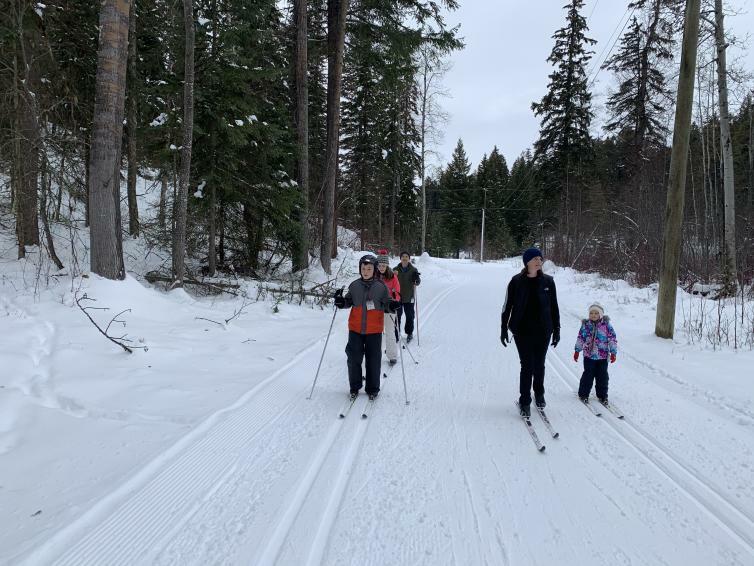 In fact, the Special Olympics of B.C.’s cross-country ski group was out exploring the trails and one of the coordinators talked it up during a break on the trail. She noticed that my son has autism and invited us to come and ski with them. What a heartwarming welcome on our first day out. Nothing brings a family closer than shared experiences and lots of laughter. We laughed when we couldn’t figure out how to click on our skis, we giggled every time one of us lost our balance, and we chortled at silly antics such as “moon-walking” backwards on skis. It was a day spent exercising in the great outdoors, being silly together, and having fun. We’ll definitely return! Kelowna Nordic Ski and Snowshoe Club east of town on Hwy. 33 maintains 75 km of groomed and track-set trails. Bring your own equipment. Together, SilverStar Mountain Resort and adjacent Sovereign Lake Nordic Centre offer 105 km of groomed trails—the largest cross-country trail network in Canada. Rentals are available at both. Rent skinny skis and hit the Nordic trails from the Happy Valley Lodge or the Black Forest parking lot at Big White Ski Resort.